Live a Vacation Lifestyle in Tega Cay! Tega Cay a Polynesian word for “beautiful peninsula” is spread out over 1600 acre peninsula on the southeastern edge of Lake Wylie. The landscape is diverse with rolling hills and lots of trees and over 12 miles of shoreline. The City’s Slogan is “The Good Life”. The first homes were build in the 1970s and Tega Cay maintains its Polynesian roots through its unique home designs and street names, like Molokai Drive, Marquesas Ave and Tana Tea circle. The City of Tega Cay does not have mandatory Association Fees! Amenities, for example the Swim Club or Tennis, are a la carte and you can choose if you like to join! At one time Tega Cay was a gated community until it incorporated on July 4, 1982, and became a city in order to protect the rights of home owners. To this day residents of Tega Cay residents still celebrate their own little Independence day or “Tega Cay Birthday” every 4th by launching fireworks and decorating their boats in red, white and blue. Tega Cay Golf Club features a 27-hole golf course and clubhouse and nearby the Tennis Courts with an active tennis Association. For runners and walkers there is a more than 5 mile stretch of Walking Trails. At the end of the peninsula, Windjammer Park, is a popular spot with its Sandy Beach, Covered Picnic Area, Playground and Boat Dock. During the summer months, you can see the Carolina Show Ski Team perform at Windjammer Park every Friday night. Turner Field and Runde Park offer ball fields, soccer fields, basketball courts and playgrounds. Runde Park is also the site of Tega Cay Park and Recreation’s summer concert series. There are three Boat Launching Areas and a Marina to store your Boat! The Tega Cay Beach and Swim Center features an eight lane junior Olympic size pool and kiddie pool, deck overlooking the lake, beach area, volleyball court, picnic sites, and snack bar. Lake Shore on Lake Wylie has more than 1,200 new single family homes ranging from the low $300’s to the millions for lakefront homes. Lake Shore also offers condominiums and townhomes priced from the $170’s to up to $350’s. The community enjoys the amenities of Tega Cay – including the golf course, beach and swim center, and area parks – but also several parks within the newly developed area, Lookout Park, which offers a picturesque setting with beaches waterfront deck, picnic sites and gazebo. With about 4,400 residents, Tega Cay’s population is expected to boom in the next few years due to several new developments within city limits. Lake <?xml:namespace prefix = st1 ns = "urn:schemas-microsoft-com:office:smarttags" />Wylie is becoming Charlotte region’s latest new housing hot spot! People who’ve lived for generations in Mecklenburg, York and Gaston counties and newcomers to the region are choosing Lake Wylie for its competitive prices, upscale neighborhoods, good schools, lower taxes, recreation opportunities and quiet lifestyle a short drive from the culture, sports, shopping and workplaces of Charlotte. Once the widening is completed of N.C. 49 from Charlotte to the lake and the opening of a local leg of the Interstate 485 outer belt has helped growth into an even higher gear. Everywhere around the lake you can see growth, in neighborhoods both inland and along the shoreline; in mixed-use retail, residential and office complexes along the N.C. 49 corridor; in roads being built and widened; in new businesses catering to new residents; and in community services from churches and schools to museums and recreational facilities. Lake Wylie is accessible for people to get to and from work and to get around. The demographics are showing more of a shift to higher income families, and businesses see that as a great opportunity to come into a new market. Then the publicity of events like the Bassmaster Classic last year and HomeArama this year fuel interest. Events like this draw awareness to LakeWylie in the Charlotte region. Because of the proximity many folks can get to work in Charlotte from LakeWylie and YorkCounty faster than they can from other parts of the city. A lot of that is due to the work YorkCounty has done to roads and to recent improvements on the MecklenburgCounty side of the BusterBoydBridge. The convenience just makes it even more enticing to build. Lifestyle options also are attracting new segments of the residential market, business officials say. In Tega Cay and the planned community of Baxter, families are drawn to the strong school district, recreation and amenities such as restaurants, shops, community centers and a YMCA. Lake Wylie offers recreation, beautiful waterfront access and a quieter atmosphere. The whole face of southwest Charlotte is going to go through a dramatic metamorphosis in the next five years with developments like RiverGate and Ayrsley. And with 485 opening, you’re 15 minutes from the airport, 25 minutes from SouthPark and 25 minutes from Ballantyne. A privileged lifestyle brimming over with southwest Charlotte's most outstanding resources and the Lake Wylie area most enticing attractions. 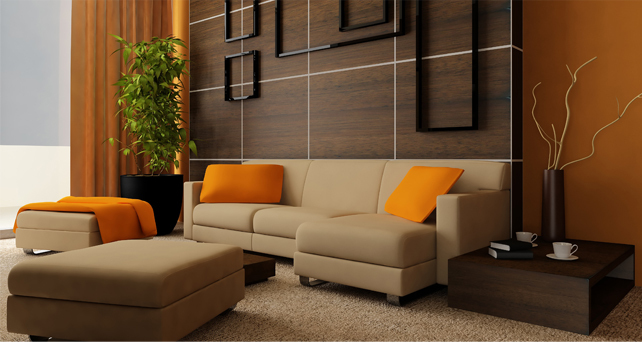 HuntingtonForest is a community designed to make your life luxuriously easy. Nestled amid wooded groves and peaceful glens it will bring nostalgia of an old-fashioned, people-friendly community, complete with welcoming streetlights and tree-lined sidewalks. And, just for fun it has desired amenities at your front door, including a Junior Olympic Pool, clubhouse, community playground, scenic walking trails and places to gather. DR Horton already is responsible for several local developments including Baxter, Lake Shore at Lake Wylie and Waterstone in York County and Huntington Forest, among others, in MecklenburgCounty. The company represents the nation's largest home builder in the last three years and the Charlotte division alone accounts for more than 500 of the homes built locally within the last year according to the company's divisional office in Charlotte. Lake Forest at Lake Wylie: Things are changing rapidly at LakeWylie; a developer is planning two YorkCounty subdivisions valued at a combined $55 million on LakeWylie. Nu-South Builders Inc. has plans to build 66 homes in Lake Forest. The community will include a lakefront park and about 97 townhomes. The Lake Forest community will be built on 19 acres near the crossing of S.C. highways 49 and 557, not far from The River Rat Restaurant & Pub. Citizens South Banking Corp. is providing financing for Harper's Green. To be developed on 35 acres off S.C. Highway 49 it will feature a lakefront park that will include a swimming area and a fire pit. About 12 homes will offer views of the water. Homes will measure 2,750 to 3,500 square feet and sell in the $390,000s. The project will take about two years to complete. American Community Bancshares Inc. is financing the development. Townhomes in Harper's Green will feature brick and stone construction and sell for about mid $200,000. Amenities will include walking trails and a pavilion with a fire pit. River Hills at Lake Wylie, on S.C. 49, is one of the most established neighborhoods in the area, with homes ranging from condominiums to mansions on LakeWylie. The neighborhood of cedar and cypress-framed homes includes a gated entry, tree-lined streets, an 18-hole golf course, 10 tennis courts and a 221-covered-slip marina. There is plenty of new construction on GastonCounty’s Belmont peninsula, including waterfront communities and less expensive contemporary housing. As the Fort Mill area experiences exciting growth, more and more new businesses are choosing to call Baxter home. The Village of Baxter’s Town Center now features a wide variety of businesses including retail, restaurant, medical, and corporate. Living up to the community’s vision of a traditional neighborhood that combines the best of the past with the technology of the future, Baxter’s Market Street has become a gathering place for locals seeking great food, shopping, and more. Tega Cay , another established upscale lakeside community, is off I-77 and Gold Hill Road on a peninsula of LakeWylie in South Carolina. The neighborhood was begun in the 1970s and was originally modeled after a Polynesian resort. Located a mere 20 minutes from Charlotte, LakeShore at LakeWylie is a community composed of 1,200 single-family homes and townhomes located on a LakeWylie peninsula. LakeShore boasts of a golf course, beach club, parks and walking trails as well as lakefront property. Prices for LakeShore range from the $170,000s to $1000,000. The Waterstone community, a 590-home subdivision offers a variety of home styles and prices, is located behind TegaCayVillageShopping Center. The Landing offers a peaceful atmosphere of nature and waterfront living in addition to its walking trails and park. 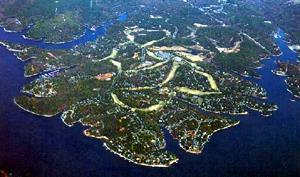 The developer, Crescent Resources, is well known for its custom designed homes and wooded lots. Another Crescent development, The Sanctuary, is spread over 1,300 acres in southeastern MecklenburgCounty along the shores of LakeWylie. In relationship with Audubon International, The Sanctuary seeks to maintain the natural beauty of the lakefront property, offering massive lots that average 5 acres in size. 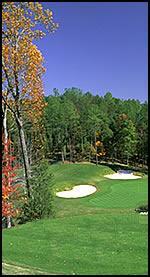 Recreation and Fun is also offered onthe NC and MecklenburgCounty side of LakeWylie. McDowellPark is located on N.C. 49 just as you approach the bridge. 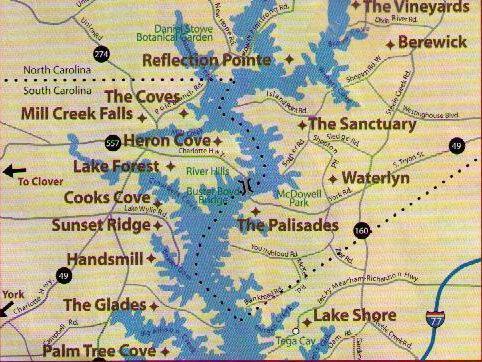 The park offers a sweeping view of some of the most scenic areas of LakeWylie accessible by car. The 1,108-acre, county-operated nature preserve offers hiking and camping. You can also rent canoes and paddleboats or enjoy the nature center’s displays. On the Fourth of July, LakeWylie is a popular place to see a patriotic display of fireworks. Boats assemble near the bridge and landlubbers park their cars nearby to see the colorful display. During the Christmas season, boaters decorate their rigs with lights and wreaths for the annual Christmas boat parade.During the summer months, the lake is a big draw from around the region. CampThunderbird, a YMCA-operated summer environmental camp, attracts hundreds of school-age children for fun and learning. Boaters and water skiers also flock to the lake. If you plan to go boating or skiing, check the safety regulations imposed by the Lake Wylie Marine Commission. Among other things, the rules require a third person aboard each boat pulling a skier (the third person serves as an observer) and set restrictions on blood-alcohol content for water skiers. Daniel Stowe Botanical Garden is located on 450 lakefront acres on South New Hope Road in GastonCounty. The property is the former home of Daniel Stowe, a textile businessman, and his wife, Alene. The couple gave the property, along with $14 million, to establish an endowment to develop the garden. Currently, 110 acres have been developed, but operators have plans to develop the entire property into one of the premier gardens of its kind in the country. The garden recently opened a grand, 13,500-square-foot visitors’ pavilion and extensive new gardens. The attraction includes themed gardens filled with plants that thrive in Piedmont soil and weather, accented with a dozen sparkling fountains and canals. The garden is open seven days a week. Public Schools, Private Schools, Hospitals, Utilities etc. Ask Angie to represent you when buying or selling your Home in Tega Cay! The low crime is attributed to the community involvement and our Tega Cay police department, who has its seat at the entrance of Tega Cay. Since Tega Cay is a peninsula there is only one road, Tega Cay Drive, which leads in and out the city. If a resident would see a suspicious activity, they can just call the police department and they’d stop the car. We hope Tega Cay can keep this low crime rate in the future. Good thing is this city is almost finished building and they will be very few more residents.